When Chile was hit by a magnitude 8.3 earthquake this week, the very ground shifted. By comparing images before and after the earthquake with an interferogram, geophysicists can measure just how much and where the ground moved. An interferogram is a geophysical tool for tracking changes in surface topography over time. It can be used to find landslides, or to spot when a magma chamber is filling and forcing a volcano to bulge out prior to an eruption. It can track subsidence when groundwater is being over-pumped or a river delta is sinking, or can watch the incredibly slow flow of glaciers. But possibly most dramatically, interferograms can be used to spot just how much an earthquake tore the ground in a burst of energy, shifting the very earth in a few seconds of severe shaking. Interferograms are created by visualizing the interference pattern between two synthetic aperture radar (SAR) passes. When radar images of the same location at the same angle and distance are taken at different times, we create an image of the interference between the radio waves to very precisely measure changes in the intervening time. This particular interferogram was created using data from the ESA Sentinel 1 satellite taken on August 24 and September 17, 2015, capturing displacement from the earthquake on September 16th. For this particular interferograms, each full colour cycle—a fringe—represents a displacement of approximately 2.7 centimeters. When the fringes are close together, that means the ground has moved a lot over a very small distance, an abrupt change between satellite passes in a steep deformation. When the fringes are farther apart, it’s a more gradual buckling. Closest to the epicenter of the Chile earthquake, the fringes are very tight together indicating greater abrupt displacement, growing broader farther away. Interpreting these fringes as ground displacement requires one more step: incorporating the motion of the satellite. The satellite images are taken obliquely at an angle, not straight down. The InSARap Project team’s initial interpretation is that the earthquake caused between 0.5 meters horizontal displacement, and 1.4 meters line-of-sight of displacement. The lower estimate is from looking at the phase difference in burst overlaps (which indicates horizontal motion), while the higher estimate is from manually counting the fringes along the line-of-sight for the satellite’s path. The actual colours are a bit more bizarre to conceptualize. SAR measures the phase of the wave, not an absolute distance, so the colours represent phases from 0 to 360 degrees. When the phase difference is 360 degrees, visualized as a full colour cycle, that means the ground moved the distance of one full wavelength of the radio wave. The areas of colourful static with no clear fringes are incoherent areas. Incoherence happens when a rugged surface like water, a landslide, plant cover cause a poor signal reflection and the waves interfere with themselves. The result is each pixel is assigned an effectively random number, different from adjacent pixels and looking more like a jumble of coloured sand than tidy bands. 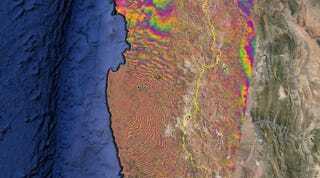 In this inSAR image capturing the Chile earthquake, the ocean is pure static, as is the thickly vegetated lowlands of the Andes Mountains. Thank you to Petar Marinković and Francesco Casu for their interpretation assistance, and for their helpful corrections on my original explanation of the displacement analysis.